The Philips BDP7501 is a no-frills, no-fuss 4K Blu-ray player. It has some relatively crippling negatives that come in the form of ho-hum performance and a ultra-barebones OS, but it will live up to moderately set expectations. With 4K Blu-rays finally hitting store shelves in significant numbers, electronics makers are rushing to develop players for the new discs. Panasonic, for example, has two of these ultra-high definition players – the fantastic, but expensive DMP-UB900, and the all-around excellent DMP-UB700. Problematically, though, the latter is only available in the UK. So what does the US get? The answer is the $229 Philips BDP7501, a no-frills 4K Blu-ray player that does exactly what it says it does. Not interested in a smart OS to go along with your new Blu-ray player? Good, because the BDP7501 doesn’t have one. Don’t care about Amazon, Hulu or streaming services like HBO, STARZ and Showtime et al? No problem. You won’t find them here. That’s the beauty and the shame of the BDP7501 – it works exactly as advertised. There’s something distinct about the BDP7501’s design. It’s not a rectangular player that we’re used to seeing from traditional manufacturers, but a square with rounded corners. That separates it from all the similar-looking Blu-ray players on the market and the rounded corners helps it blend in with most home entertainment centers with all their circular puck-shaped Rokus while still giving it a functional design. Each face of the BDP7501 is covered with a brushed aluminum finish with the center tray, which folds forward to insert discs, sporting the Philips logo. On top you’ll find two buttons – eject and power – which means you’ll need to find the remote if you want to play your film. Also on top is a rubbery covering that, we assume, keeps other devices you place on top of the player from slipping around during playback. Spin the player around and you’ll find a few sparse (but relatively important) ports. There’s two HDMI out ports (one for audio and video, and one for just audio), plus an ethernet port and USB port in case you want to insert a flash drive for photo or video playback. There are a few things we’d like to see here – including an SD card slot to display photos straight from your camera and a few more audio-out options – but what you get here is more than enough for the basic functionality. One of the big disappointments for us with Philips first 4K player is the general lack of content on the player itself. Sure, most people will go out and invest in a 4K Blu-ray collection soon after purchasing this player, but there are some that will be slower to adopt the new technology. Those people might be disappointed to find just two services on-board: Netflix and YouTube. Both services come in 4K iterations and can be accessed via the two shortcut buttons on the remote, but it would’ve been nice to see other streaming services here. Panasonic’s player has Netflix, Amazon Video, YouTube, BBC iPlayer, BBC News and Sport, Netflix and My Space – along with several more lesser-known apps. The difference here is night and day. Moving past that, the interface the BDP7501 uses is simple and straightforward. You’ll find sections for videos, music, photos, home network (a.k.a. Your DLNA server), video apps and setup in one row on the home screen. The home screen sits on a blue gradient background that, to our knowledge, can’t be modified in any way. That said, as mentioned above, you can insert a flash drive for photos and music, or simply insert a CD or DVD should you want to use your player for more than just watching films. As far as pure specs are concerned, the BDP7501 looks good. It supports the BT.2020 color space, a dynamic range up to 10,000 nits (despite the fact that the brightest TVs only hit about 2,000 nits), 10 or 12-bit depth and H.265 video files. And while that all sounds impressive, the final result is simply ho-hum. Scenes from Star Trek or Creed in UHD don’t have a particular shimmer or sheen that you’d find using another player. Yes, some scenes do really benefit from the expanded range – we noticed especially space scenes that typically have a bright white next to a dark, inky black – but most 4K video footage look more or less like a 1080p Blu-ray. Part of that is because when you use a 1080p Blu-ray, the player will still upscale for 4K when connected to a 4K panel. You’ll lose some of the fidelity from HDR, but more or less the picture comes out the same: lackluster. Some scenes look washed out, others have a heavy grain to them and some simply look no better than they do on a 1080p TV. And while that sounds bad, there are two positives that are worth focusing on here. The first is that the player offers an HDMI out for audio-only that you can use if your receiver isn’t up on the latest HDMI standards and can pass 4K signal to your TV. The second is that the player itself, while a bit slow to get going (booting up and starting playback), doesn’t introduce any latency into the system. Another admittedly much smaller benefit is that the player is whisper quiet and stays supremely cool under a heavy workload. Those facts don’t make up for the fact that movies don’t look as sharp as they possibly can or for the relatively few options for streaming services, but they’re appreciated nonetheless. The last small bonus is that the player actually tells you what type of content you have playing on your screen as soon as playback starts. Not sure if you’re getting your full HDR 4K video? All you need to do is press pause to find out. 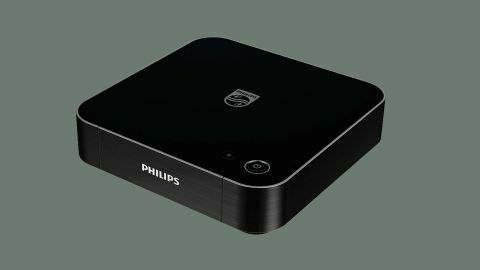 Philips’ 4K Blu-ray player hits some of the right notes and the fact that this 4K Blu-ray player costs just as much as some regular Blu-ray players is a great start. Follow that up with 4K versions of Netflix and YouTube and you have a competent – if not exactly impressive – first foray into ultra-high definition. Video playback is a double-edged sword here. No, it's not really that bad, but it's not really that good either. It simply works as you'd expect without any negative or positive connotations to it. But where the player runs into real trouble is when you'd like to watch anything outside of a 4K Blu-ray disc. The player supports 4K versions of YouTube and Netflix, but there's no way to stream Amazon, HBO, Hulu or even Crackle while using this player. For better and worse, the Philips BDP7501 works exactly as you’d expect. It’d be great to say that it plays 4K Blu-rays how they’re meant to be seen, but that isn’t exactly the case. Similarly, while it certainly has the ability to display the highest resolution content, you won’t really feel a sense of grandeur while using it. And beyond the mediocre playback, the BDP7501 failed to provide content outside of the one provided UHD Blu-ray and two apps. Philips’ first 4K player makes the most sense for someone looking for a low-cost way to play their burgeoning 4K Blu-ray collection while they wait for the prices to come down. Everyone else willing to pay a bit more money (or move to the UK) should be looking elsewhere.